Three weeks ago I wrapped up chemo treatment #2 of this cycle and am happy to report that the experience was much better than the first. Although I had quite a bit of pain in my arm during the actual session, the recovery following the appointment was much smoother than the first; I didn’t have nearly the same amount of nausea and fatigue, and I regained dexterity in my hand and arm much quicker than the previous time. It’s hard to believe that was already three weeks ago, and that I’m gearing up for another appointment tomorrow…ugh. Despite the fact that the last appointment went well, I am still dreading this next one. As much as I try and not let these appointments dictate my schedule and control my life, it’s hard not to. For example, in preparation for my next appointment – knowing I’ll be tired and lackluster – I’ve tried to get everything taken care of ahead of time. So throughout these past few days I’ve done the laundry, shaved my legs, gotten groceries and changed my ostomy bag, all in anticipation of being too exhausted to do these types of tasks after my appointment. In other news, I’ve continued to keep busy with work, teaching, and travel – all good distractions. For a while, Nick kept urging me to go get a massage to help alleviate the stress of recovering from surgery and dealing with chemo treatments. While that may sound all nice and dandy and his intentions as a loving husband were in the right place, I couldn’t get him to understand that after all the doctor appointments, surgery and hospital stays I’ve been through, the last thing I wanted was some strangers hands all over me. 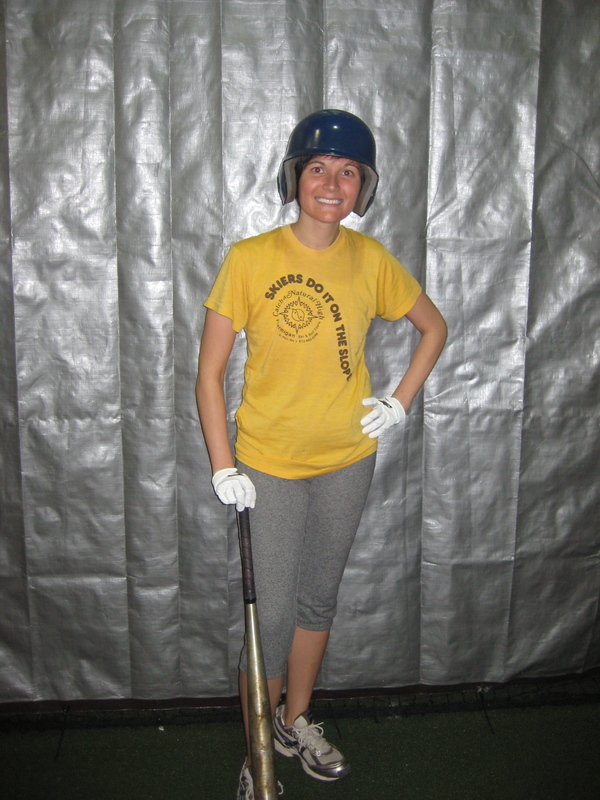 Instead, I found an even better stress reliever: batting cages. Never underestimate the power of watching a ball connect with the sweet spot on your bat…there’s nothing like it. One Sunday afternoon, Bill, Jane, D.J. and I took over a cage at a new facility that opened up near the house. Staying true to form, Nick put on his favorite golfing outfit and brought his clubs to hit golf balls alongside us. The experience was far more therapeutic than any massage parlor could have offered. I have no doubt we will be heading back for more sessions in the future.